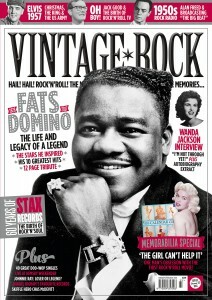 This issue, we pay a lengthy and in-depth tribute to the late, great Fats Domino. He had no dance moves, he didn’t rock a guitar, he wasn’t even much of a showman… but without Fats’ vision, songs and pioneering recordings, rock’n’roll as we know it would not likely exist. Don’t miss Vintage Rock’s 12-page extravaganza saluting his life, greatest records and the vast influence Fats had on The Beatles, Little Richard, Elvis and numerous other artists. Elsewhere we revisit the early days of rock’n’roll on the radio and TV. We chart the pioneering US stations who not only played rock’n’roll but also recorded the likes of Ray Charles and turned those sessions into hits. In the UK, we salute the unrivalled influence of Jack Good, mastermind of Six-Five Special and Oh Boy!, and a man who not only captured teenage culture on camera but helped shape the music too. Shakin’ Stevens, Cliff Richard, Joe Brown and others guided by Good help us pay tribute. We talks exclusively to Wanda Jackson as the Rockabilly Queen publishes her must-buy autobiography Every Night Is Saturday Night (read an extract, too), celebrate the rockabilly label turned 60s soul powerhouse Stax Records, and recount what Elvis Presley got for Christmas in 1957 (clue: it involved a uniform, food rations, early starts and lots of physical exercise). « Vintage Rock Presents Johnny Cash is on sale now!